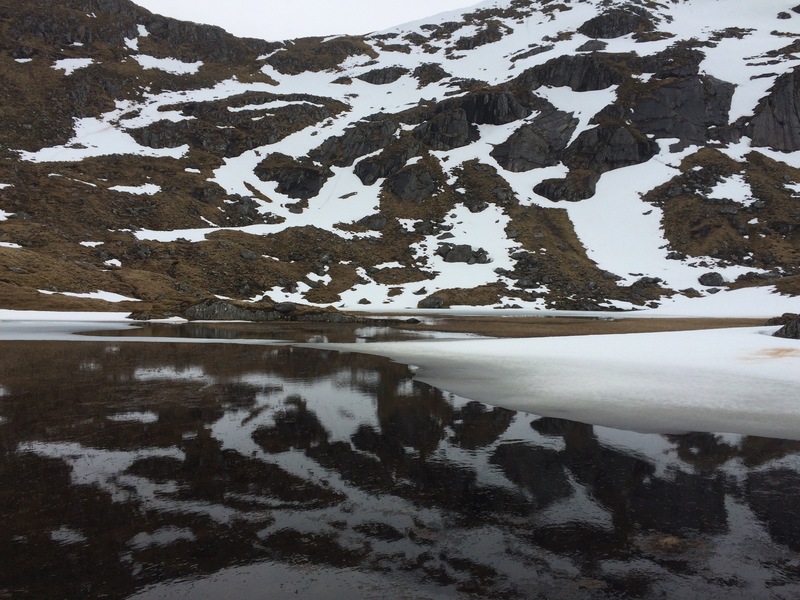 Part 2 of the Glen Affric Blogs. Morning dawned grey and damp. The cloud sat along the base of the hills about a ten minute walk from the youth hostel. “We could always do just the one Munroe and see how we feel” said Jo. “There’s bound to be a cloud inversion with blazing sun on the summits” said I, ignoring all possibilities that we would do less waking than we had committed to when we were planning the trip. We got packed up and headed off, straight up the back of Glen Affric hostel on an excellent path. A couple of men had arrived late and pitched their tent between the main military green corrugated iron hostel and the nearby dorm. They were finishing their packing and headed up just after us with enormous rucksacks. 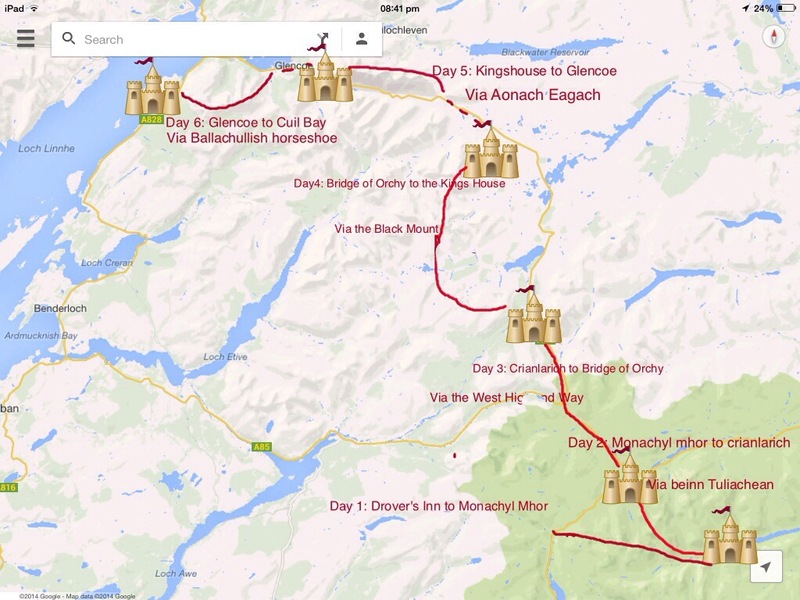 Their plan was to do a few Munros and sleep high, then complete the set the next day. Our plan was to do the same but return to the comfort of the youth hostel for the night. Despite my natural inclination to conversation and chat, my plans for the trip had been a quiet, contemplative pacing the hills to free the mind of clutter. This clutter had accumulated during a long period of being over-busy, over-stressed and not having enough visits to the wide open spaces of the hills. Jo, my long-suffering walking companion, on the other hand, sees long walking trips as a chance for lots of chat and catching up. So once we fell into step with the other two walkers (there was no getting away from them, I tried an onslaught of speed but I slowed eventually and they caught up) Jo was in her element, chatting away. As we traversed the peat hags, just before the final ascent to the coll I overheard the conversation that one of them had driven from Essex via Warrington to pick up the other and then straight through to Glen Affric – and I had thought we’d been in the car for ever coming up from Glasgow. ‘What do you do in Essex?” I asked “I am an accountant in a firm that sells coat hangers” he said. Well. What do you say to that? I’d never before had the opportunity to make conversation with an accountant from Essex working for a firm selling coat hangers. “No I hate it but l can’t leave” he said. I asked him why not and he told me about the generous benefits that he gets with the role. “I get free petrol for my own use, as well as work” he said triumphantly, “it helps when you love the mountains so much and you live in Essex”. No doubt, I thought, but then immediately wondered why he didn’t just leave the job and move to Scotland which would, at once, solve both of his problems. “We get as many free coat hangers as we want too” he continued. But I wasn’t in a life coaching mood, I had come to find wildness and I couldn’t get to wildness until people and chat and the stuff of civilization, especially thoughts about coat hanger manufacture, were left behind. We continued on our separate way when we reached the coll and the day began. The sun started to shine through as we reached the top of the first Munro, An Socach. A misty brightness, as if the light was within the cloud around us. Directly above we could make out a pale, chalky blue but the sun couldn’t burn though to reach us. I imagined that, with another 10m of altitude we’d be in broad sunshine looking down all around us on a sea of cloud with a few of the tallest mountains poking through. 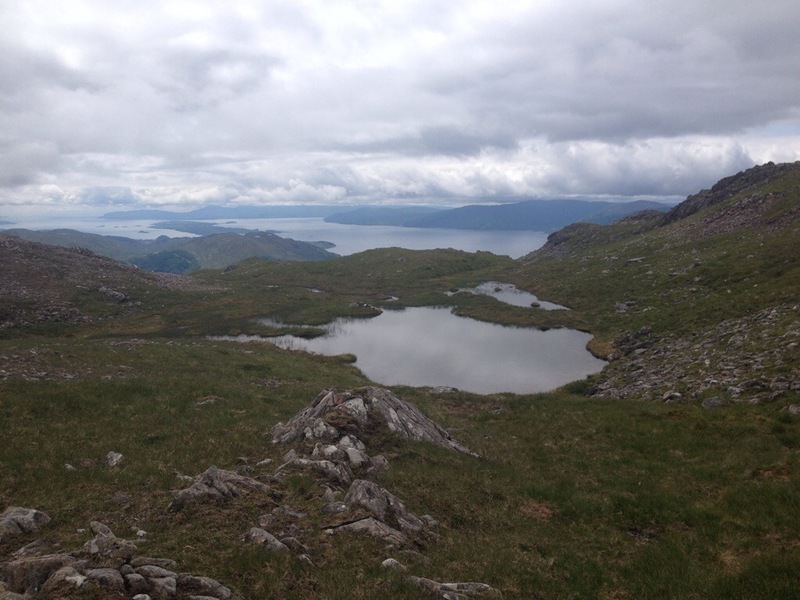 Munro number one done, we wandered down the gentle broad ridge to a coll littered with small peaty-black pools. The two mountains beyond were behind a couple of smaller peaks, and Jo had started talking about possibly fitting in a fourth, Beinn Fionnlaidh, which was utterly miles away. Anyway. The hill was lovely. There was snow. And sun. And those fantastic shattered stone pavements on the summit ridge. I’d got to the point of thinking about nothing in particular, and had started noticing things, like lichen mapping out whole continents on a piece of ice-smoothed rock, and slivers of silver layered through the schist, when I tripped on a bit of rock, coming down really hard on my knee. It was properly, awfully and excruciatingly painful and I lay on the snow in the foetal position screaming intermittently like a hoarse siren. I could hear Jo in the distance, as if through glass, saying “take your time Kat” and then my own personal opiate supply kicked in. I lay there motionless and silent on the snow wondering when Jo would come over to see whether I was dead. And then I wondered absent-mindedly, if I wasn’t dead, whether a helicopter was going to come and pick me up. It turned out I wasn’t dead. I just had a grazed knee. I made a mental note to increase the level of sympathy towards my children when they graze their knees in future. This was a very strange house with door and window almost on the summit of Mam Sodhail. 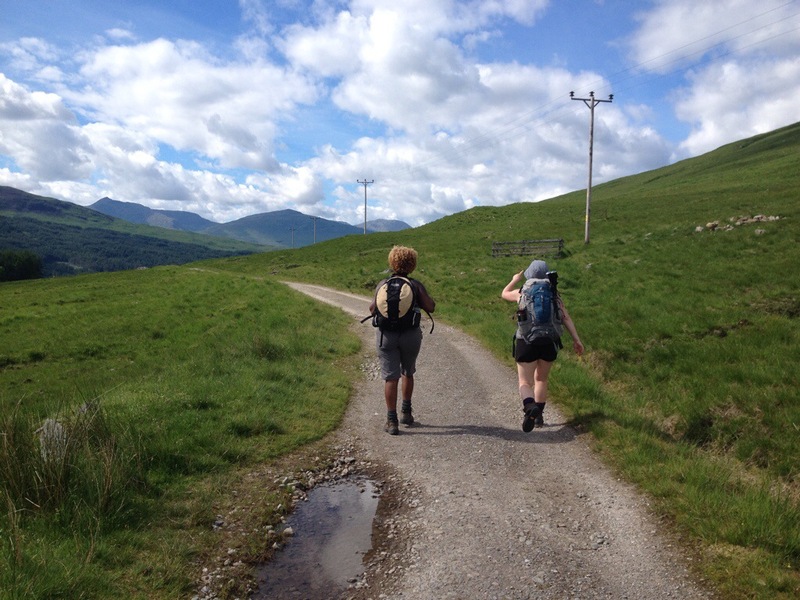 It took two dressings and a handful of jelly beans and then I was back on my feet and we headed to Munro 2 of the day. I had no pain, it was a miracle, I almost ran to the top. Jo pointed out that the sun was out and it had got quite warm, melt-water was trickling down the hill from the remaining snow on the ridge. 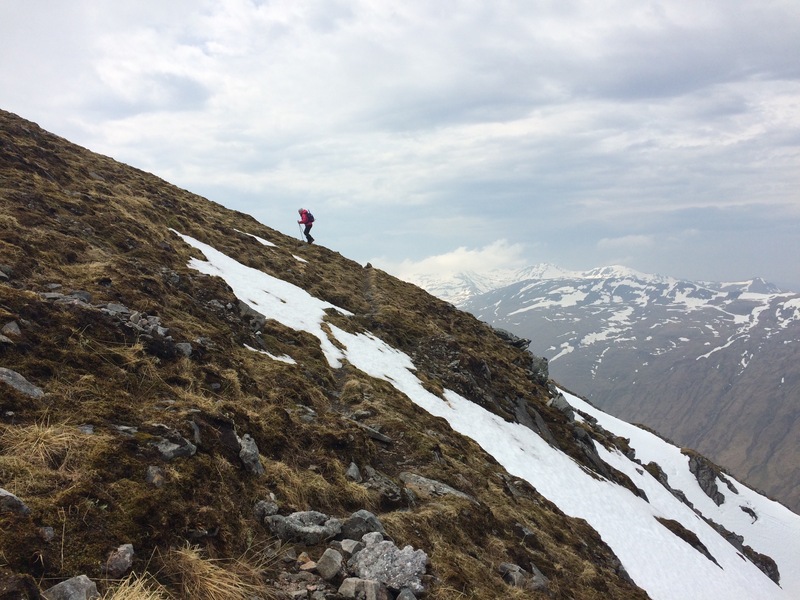 I declared it ‘taps aff’ and said we shouldn’t miss out on Munro 3 because of my knee. “It doesn’t hurt at all at all” I said. 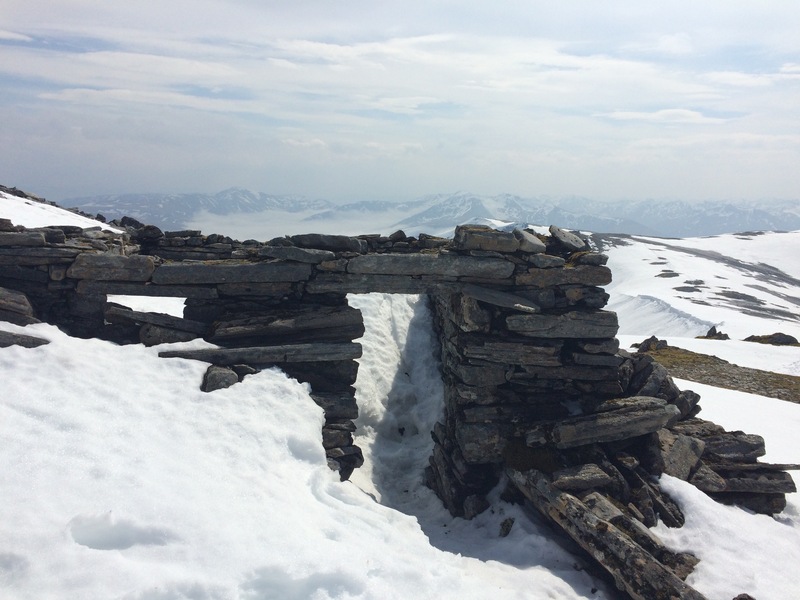 We reached Mam Sodhail and sat down by the an extremely well constructed and enormous cairn for a snack, not expecting to see anyone. But a couple were just approaching from the other side. I hastily put my top back on, and then my knee started to hurt. The couple regaled us with their experiences of coming up and over the melting cornice, “no we didn’t have any ice-axes” they said. Jo and I paled, as we looked at the route they’d taken. My knee was throbbing. 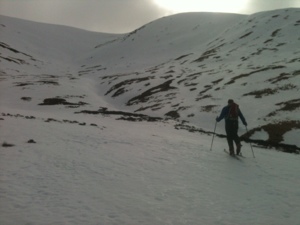 Better get back, said Jo sensibly, and we decided to leave Carn Eigh and Beinn Fhionnlaidh for another expedition. As we walked along the ridge we looked back and saw the woman standing right up at the edge of the cornice to pose for a photo. We stayed watching long enough to be sure we didn’t need to call for the helicopter, or try and effect a rescue, and then we headed back to the Youth Hostel. Postscript: the sore knee developed two pleasingly large scabs which are currently in the process of sloughing. (Is that the correct word for scabs? I certainly feel like I’m sloughing them). Lovely. Well that did turn out to be a good walk. I conceived the idea for the walk back in July (see this blog post) and amazingly managed to do everything planned. Accompanied by one dear friend all the way and by others that dropped in for certain days, it took us from Loch Lomond to Cuil Bay via 9 munroes, 6000m of climbing and around 70km over six days. “You seem to be in a great hurry,” said a man with a thick German accent as I brushed my teeth while filling my water bottle in the Glencoe YHA kitchen “Do you have some information that the mountains will disappear today in a sudden movement of the tectonic plates?” I tried to explain that I had a taxi due as I ran to the fridge to retrieve my faithful companion the French cheese, but it’s hard when you have a mouthful of toothbrush. Beinn a’ Bheithir, the Ballachullish Horseshoe, towers over the entrance to Loch Leven, its vast granite west flank dominating the skyline from Cuil Bay. 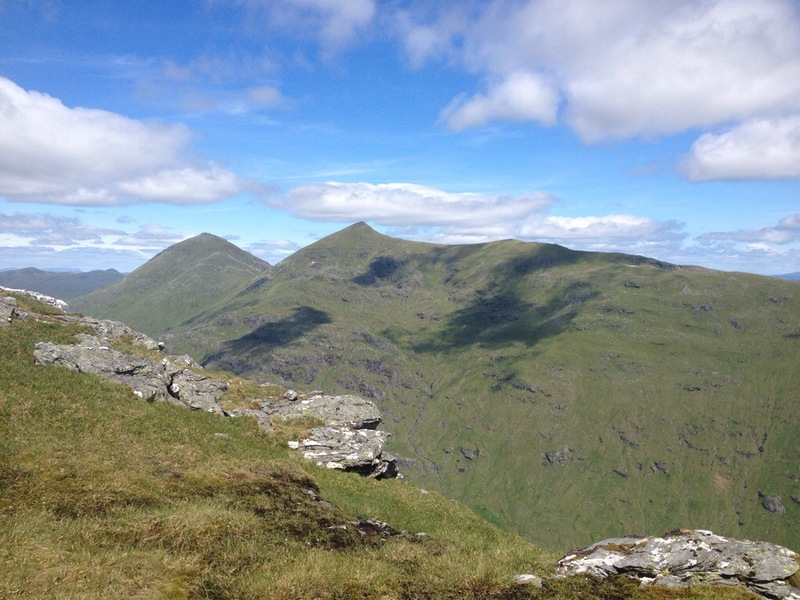 The rounded shoulders of the great mountain rise from sea level up to two munros, Sgorr Dhearg at 1024m and Sgorr Dhonill (1001m) linked by a great ridge. 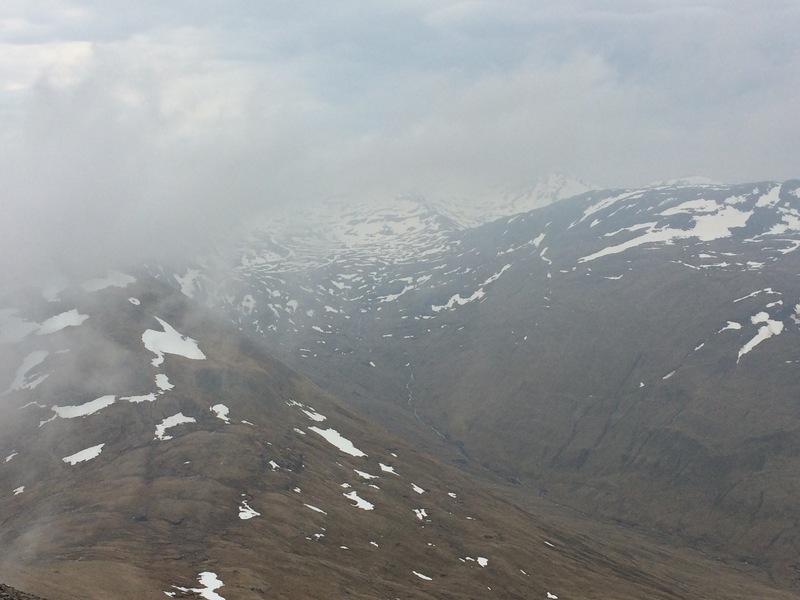 The geology of the mountain changes very distinctly between the two main summits – the east is quartzite, a hard, white metamorphic rock and this forms a delicate, white curving sharp ridge with steep scree slopes falling into the corrie below. 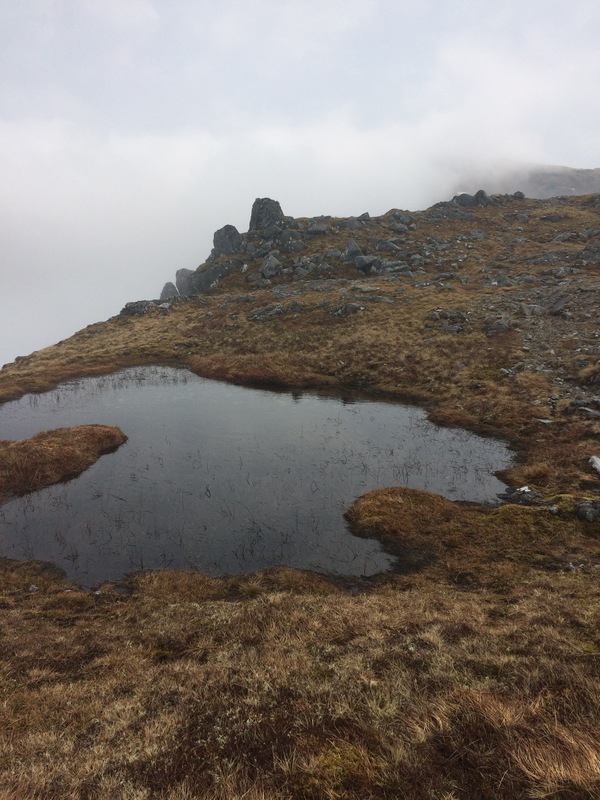 The west mountain is granite, warm, red and rounded and forming a pile of scrambly blocks and boulders rising up from the ridge to the summit and then a wide lumpy and knobbly plateau with high level lochans. It would have been tricky terrain to navigate if the cloud had come in. 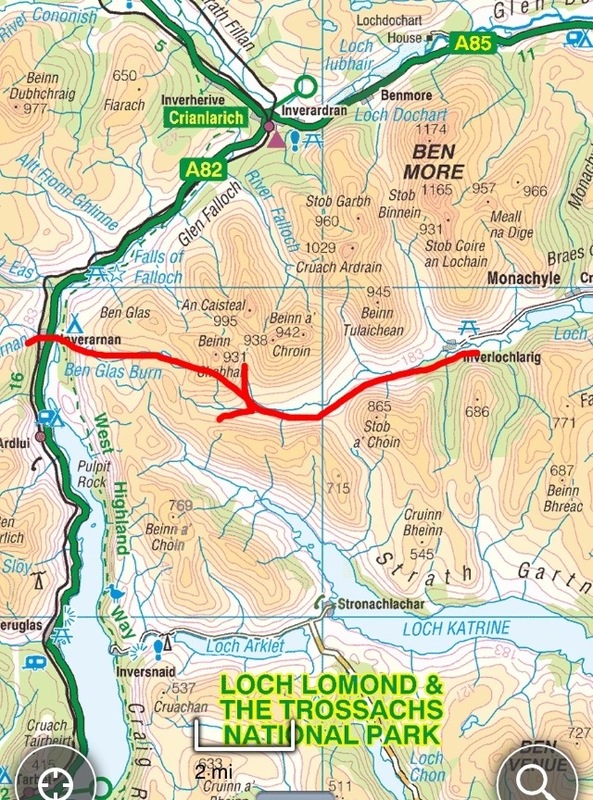 As this was the last day of our walk from Loch Lomond to Cuil Bay we took the most linear route over the mountain. Most people walk the horseshoe from South Ballachullish to start and finish at the same spot, but we set off from the field just south of Ballachullish primary school and headed through a field of sheep, over a fence and into a trackless and near vertical bog. There was lovely cotton grass, and sweet smelling bog myrtle but there was no path. I had been planning this walk since last summer and this wasn’t my route of choice. I had planned to ascend the beautiful steep and scrambley ridge that starts a bit further south of the primary school and rises almost directly to the summit of Sgorr Dhearg but my dad had other plans. He had been on the internet, he had printed out detailed maps on matt photographic paper (I’d recommend this actually). He had gadgets and he had annotated his map with GPS grid references on the line of best route, in case of poor visibility. And so we went with his route. We fought onward up the ever steepening heather and bog myrtle slope, me rapidly losing my sense of humour and wondering why one of the most popular mountains in Scotland speared to have no path up it whatsoever. Fortunately, just before we had a family crisis, Jo found the path, cutting across the slope above us and all was saved. 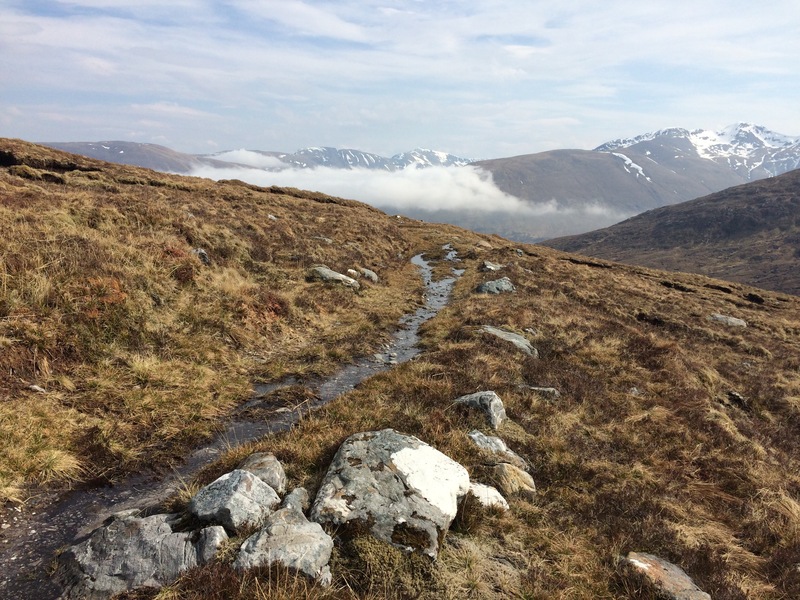 Once on the path the ascent was superb taking us onto the skyline giving fabulous views inland to the mountains of Glen Coe and the Mamores and westward out over Loch Linnhe and into Morven and Ardgour. Dad is a botanist and enriched the walk with talk of alpine plants (even though the mountain didn’t have some of the species he was hoping for). As we reached a wide part of the ridge at around 550m we came across an area of tiny, and entirely flat juniper bushes, growing to an altitude of only 2cms. 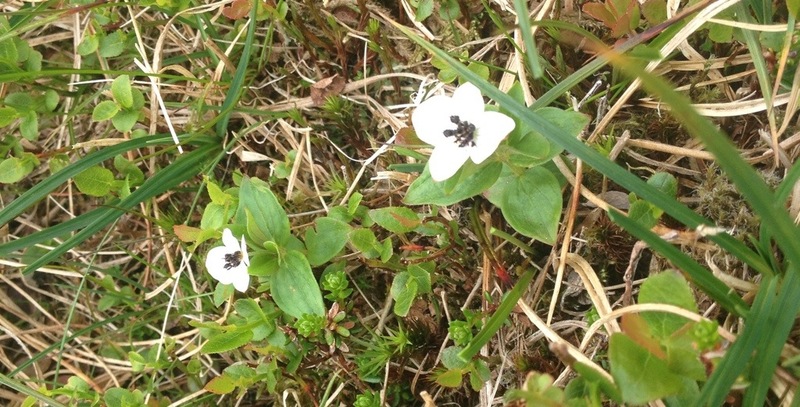 I learnt a few other plants too – alpine ladies mantle was all over the place and, once the geology changed from quartzite to granite, so did the botany. There were little patches of fern growing between granite rocks which has the curled appearance of parsley, and indeed, this was the parsley fern. 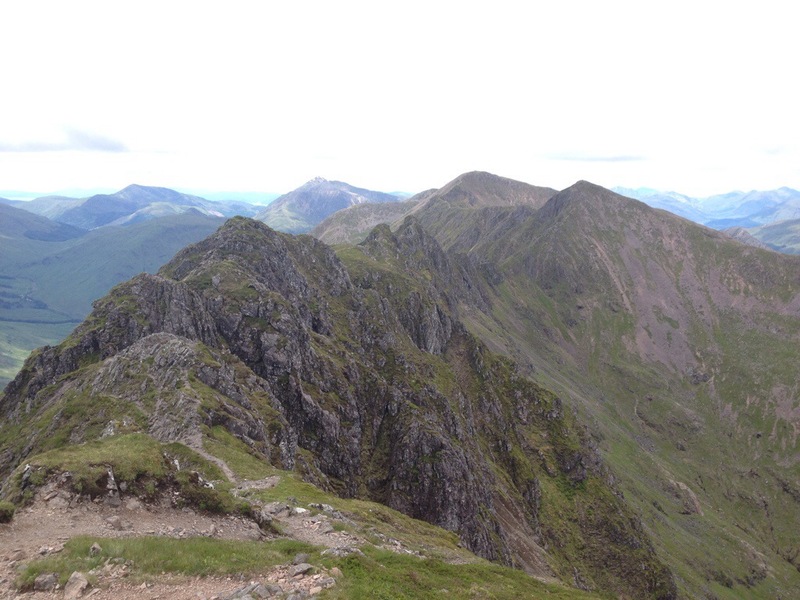 At one point on the ridge dad disappeared over a precarious cliff perched over the top of a vertiginous scree slope. I scurried to the edge to check he was alright and found him bent over a patch of tiny white flowers. Starry saxifrage apparently. Other botanical highlights were the dwarf campion, and the exquisite dwarf cornell. We wandered over the knobbly granite landscape until we came across a surprisingly large lochan at 750m altitude (obligatory swim) and then about a kilometre further on we started down the steep hillside, following dad’s carefully laid out trail of marked GPS locations, leading directly to the treasure of the Holly Tree Inn. It was here that the real botanical highlight of the day came. A celebratory, end-of-six-day-walk Gin and Tonic made with the wonderful Botanist gin from Bruichladdich Distilery on Islay. 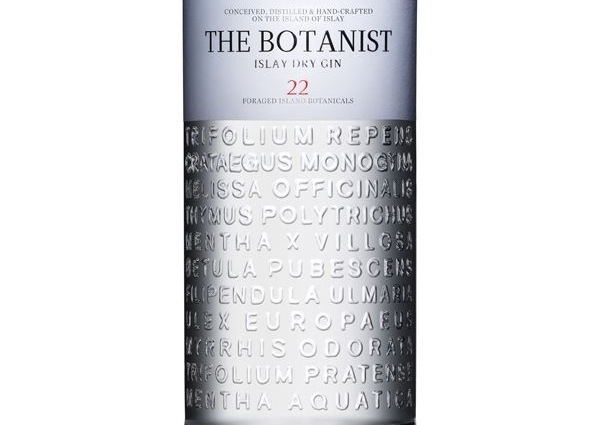 I borrowed the gin bottle from behind the bar for a Botanist playoff. Could dad tell us the common names of all the ingredients embossed on the glass bottle in Latin? We started the day in a bit of a fluster, running down the road from the Glencoe ski area, takeaway coffee cups sloshing their contents all over our sleeves. We needed to catch that citylink bus hurtling along the main road from Glasgow to Uig. Fortunately we had a friend on board who’d got on at 7am in Glasgow to walk with us for the day and he asked the driver to stop as we panted down the track. I don’t want to speak too soon but this may be turning into a ‘getting things done’ trip as well as a holiday. 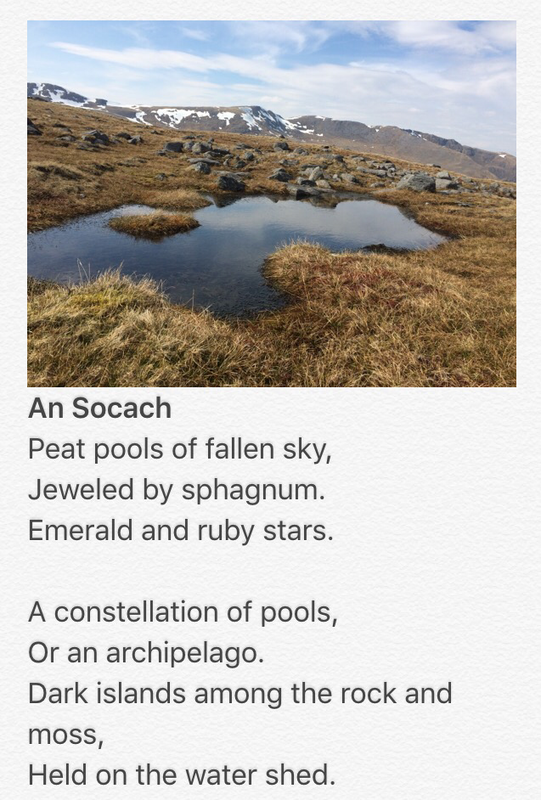 The plan for the walk was to take me from Arrochar, place of birthday celebrations, and where (too many years ago) we had our wedding reception, over mountains and through glens to take us to Cuil Bay, the place where we are building our house. A pilgrimage of sorts I suppose. When I had conceived the idea I had supposed that the house would be built and we’d be having a house warming party at the end of the walk.